Well, I am back from my week-long hiatus, and am feeling like my old self again. Before I start rattling off my list of favorites from last month, I just want to say thank you. Thank you all for your support during this truly difficult time in my life. I know that Chip was just a dog, but you don't really think of how important pets are in your life until you lose them. My other dog, Dale, has kept me company and helped me mourn the loss of his brother. I'm just grateful that I had Dale to keep me somewhat sane. And a special shout out to Alexis, Coco, Jess, & Blushing Biddies- you girls are always commenting on my posts and your support meant so much to me! Thank you all SO much. Truly, from the bottom of my heart. Sappiness aside, let's talk beauty products. I only have six products that I have gone crazy for in the past month. Let's dig deeper, shall we? Zoya Remove + - It took me a solid two years to accept the fact that the drugstore nail polish removers were doing more harm to me than good. I finally caved, ya'll. I got the Zoya nail polish remover and I am never looking back. No more strong acetone smell for me! RGB Nail Polish in Tropic- I have been dying to try out the RGB nail polish line for ages, and recently Marissa of BeauTeaBar gifted me one of their polishes in Tropic. This is SUCH a great winter and fall color. I can't stop wearing it. And it looks especially great with a gold glitter accent nail and a macaron in hand. May Lindstrom "The Clean Dirt"- I never have to use my Clarisonic again, or any other cleanser. The Clean Dirt is truly revolutionary. I will have a full review up in a couple of weeks, so in the meantime, all I'm going to say is: YOU NEED THIS. Chanel Illusoire Illusion D'Ombre- I bought this eyeshadow ages ago, and have just recently rediscovered it. It is glittery perfection, but is still wearable at the same time. And there's just something about pulling out the classy Chanel packaging out of my makeup drawer that makes this experience that much better. Vapour Organic Beauty Siren Lipstick in Courage- So obsessed with this line of lipsticks. I only have Courage so far, but I love this lipstick. I will have a review on this next month, but this is such a great red lipstick. You can apply it sheer, or build it up to full opacity. And it is CRAZY moisturizing. And all of the ingredients are organic and good for you! 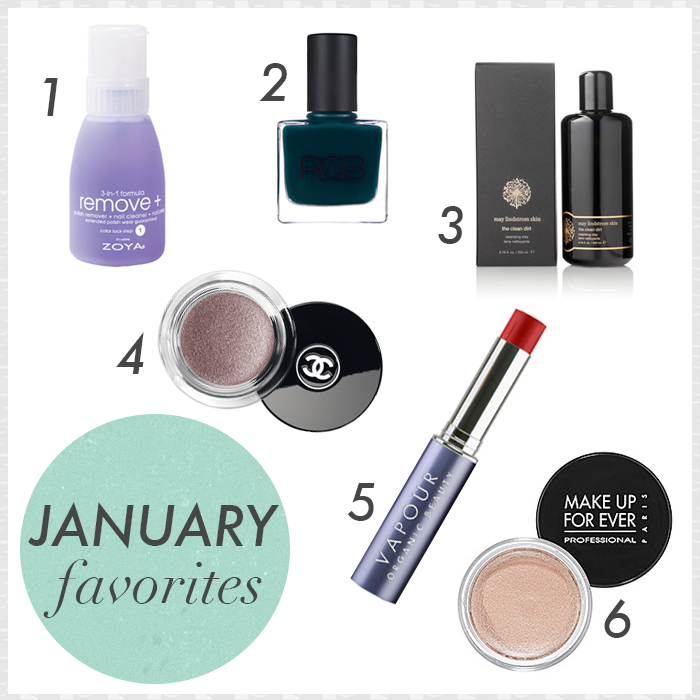 Hurray for green beauty! Make Up For Ever Aqua Cream #13- Yet another oldie but goodie. I've been feeling less than inspired lately, and have been constantly on the go. My solution is slapping this on my eyes with my fingers, smudging some eyeliner on, throwing on my mascara, and I'm ready to go. So easy, and so pretty. ALSO: I have some guest blogs on the BeauTeaBar blog up now, and I have a tutorial in the works for them, so be on the lookout for that! My first guest blog was about my journey into the world of green beauty, and my second post was 10 reasons why you should switch to an all natural skincare regime. Be sure to check them out, and to check BeauTeaBar out as well! Let's start this Monday off on a positive note! I created a playlist of my top five songs that I've been jamming to this past month on Spotify. As you all probably know by now, I'm a huge music nerd and will basically take any opportunity to share with you my favorite musicians. So here we are! I hope you guys like it. What have been some of your favorite products from the past month? And, almost as importantly, what songs have you been jamming out to? Welcome back :D I'm lovin your favs this month. I love the Zoya nail polish remover too, no more acetone ever again! And I remember another beauty blogger mentioning the May Lindstrom line, I wish I had the $$! I truly, truly struggled with purchasing from the May Lindstrom line... BUT IT WAS SO WORTH IT. Oh my god. I cannot wait to post my review on The Clean Dirt. Revolutionary!! Thanks! And you definitely should. I bought the Chanel product during a weak moment, lol. I haven't purchased anything else from Chanel because I can't justify it either! But I really love these eyeshadows. That RGB color is to die for... it almost looks like green velvet! It totally is! It's absolutely beautiful on nails.